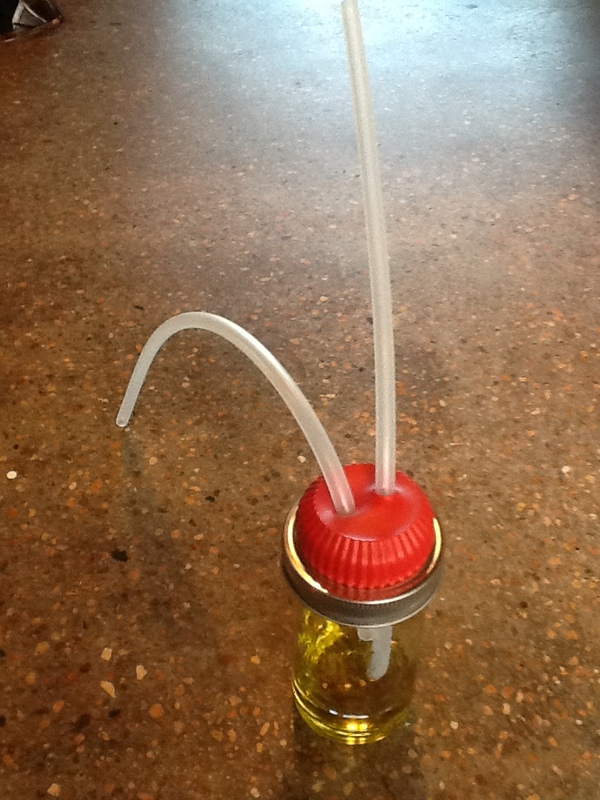 Breathing Ozone Bubbled Through Olive Oil! (BOO) | hola carrot! Breathing ozone is not something that you ever want to do. However, there is a way to do it safely – that is breathing ozone bubbled through olive oil. What you end up breathing then is not ozone itself, but terpene gas – which is produced when ozone interacts with olive oil. As of today, this is my favorite ozone treatment. This therapy is really helping me – it is very nice to feel like my brain is finally coming back! Welcome brain, I missed you!!! Now, let me show you how I prepare to breath ozone through bubbling olive oil. Ozone Generator – you want one that produces low gamma that can be measured – check Paola’s suggestions here. 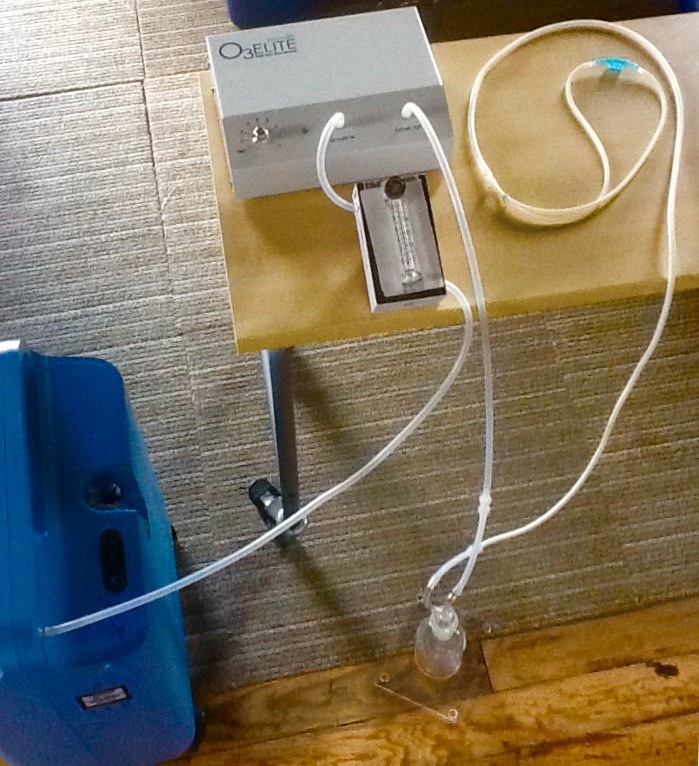 Oxygen Source – I use an oxygen concentrator for this therapy. Pediatric Flowmeter – watch my post on how to DIY a cheap one! Check valve – this is not essential but highly recommended to prevent liquids from backing up into your ozone generator. Gas Washing Bottle – the one on the video is from Promolife, you can also buy them on eBay or use your creativity to make one yourself (future post!). Cannula – I use a silicone cannula but many people seem to be fine with regular cannulas or prefer an oxygen mask. Silicone tubbing – you usually get some with your ozone generator. The regular size that fits most generators and accessories is 3/16 ID (inside diameter) x 5/16 OD (outer diameter). Connectors and Adaptors – I love these guys for connecting tubes – the luer lok ones are wonderful for generators that can plug directly to syringes. You can also use small pieces of thinner or wider silicone tubing as adaptors. After trial/error and also by learning from others, now I always fill about 1/3 of the bottle with olive oil. You might think that covering the inside bubbling ball with oil is more than enough – BIG MISTAKE! Been there, done that… What happens is that you end up breathing some ozone instead of terpene gas! You might feel discomfort in your throat and even start coughing. If this happens, take some vitamin C to neutralize the ozone (antioxidant vs oxidant). To prevent this from happening just be generous with your oil and fill the bottle close to 1/3 of its capacity! My oil looks lighter and thicker! Another thing to look for is how your oil changes in color with use. It will get much lighter and it will also become more dense. These are signs that your oil is saturating from being exposed to ozone. So, if after a few sessions of BOO you notice that your oil gets a lot lighter and starts getting more viscous, then it might be a good time to empty your bottle and get some fresh olive oil. You might also notice that during colder weather your oil will saturate a lot faster. Ozone gets neutralized by heat, but it survives longer under lower temperatures. What to do with the viscous lighter oil? I can tell you what I do. I have a glass container where I collect all the oil I can’t use for BOO any longer (as it has become too saturated) and I keep it in the freezer. I have used this oil to remove makeup, as a moisturizer and to brush my teeth (don’t swallow it!). I’m waiting to have enough oil in the freezer to venture into soap making… I will keep you posted on that one! How do I clean my bubbler? I have tried letting it soak in alcohol for more than 24 hours with very poor results. I have also tried cleaning it with baking soda and vinegar – that helped a bit. What helped the most was putting the bubbler in a pot with water and bringing it to a boil. After 20+minutes and some babysitting… it completely removed the oil residue at times, though only partially in other instances. Be careful if you try this, some bubblers are thiner than others and if they are glass they can be quite fragile. Nowadays, I have a few gas washing bottles so when it is time to figure out how to clean the bubbler I always have a spare to continue with my BOO therapy. When doing BOO, can we do it anytime or do we have to do it 1 hour before meals or 2 hours after meals? Thank you. I have done it on both a full and an empty stomach without any issues.